We were at the IM Lake Placid last week and worked together with High Peaks Cyclery. It was an amazing experience and here are some of the impressions. Ben rocked Lake Placid - he won his first Ironman with a little bit of help from SLS3. Petr had an amazing race, just one week after his 8th place at the NYC Triathlon, he finished 2nd in LP racing the SLS3 Triathlon shorts. Spencer working overtime in the shop - so many bikes to fix... good for him that he is wearing compression socks. 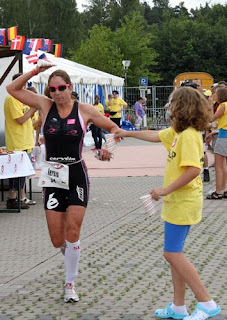 The first female tandem (blind female athlete/female guide) to compete an Ironman - we hooked them up with SLS3 compression socks. Joacelyn Wong - the Wongstar getting ready for the race. Try them and and compare. German candy - very popular during the week. This weekend was very successful for SLS3. Tereza Macel finished 3rd at the Challenge Race in Roth/GER. She finished in 9:09 hours and set a PB on the run wearing her SLS3 compression socks. SLS3 was once again the fastest compression sock in this race. We are looking forward to see her racing IM Canada at the end of August. At the NYC Triathlon it was Filip Ospaly and Petr Vabrousek who finished 1st and 8th. Petr was just "warming up" for the IM Lake Placid next weekend.